It closes the gap between vision and execution by putting visual documentation at the center of the product development process, so that all members of a team can work in context of the big picture plans that describe their complex projects. Defined and drove entirely new product development for Gliffy, from initial blank whiteboard to launched product. Built team alignment and direction through highly collaborative, rapid problem-solving sessions around product strategy, directional evaluation, turning research into actionable product direction, etc. Partnered with senior leadership to explore and define: what should we build and why? How can we best set ourselves up for business success? What high-ROI actions should we pursue and what should we postpone or not do? 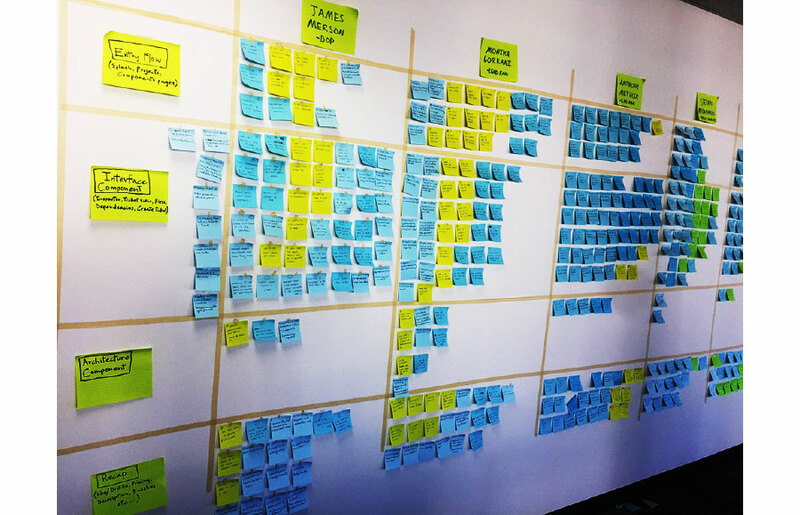 Defined and conducted interviews, surveys, and direct observation with goals of defining our problem space, user pain points, and prototype validation. Hiring, mentorship and coaching, quality of work, timing and prioritization, tools and process, design system, team and individual goals / OKRs. â€¢ Continue our focus on software teamsâ€”specifically in product development. â€¢ High usage, both frequency and breadthâ€”ideally daily use across core product development team functions (engineering, product management, and design). â€¢ Expand upon Gliffyâ€™s visual â€œsuperpowerâ€�. â€¢ Strengthen Gliffyâ€™s relationship and presence in the Atlassian Marketplace. â€¢ Mandatory multiplayer / inherently viralâ€”teams use the product together, and adoption snowballs through natural usage. How might we expand our product line-up, add value to existing customers, and increase product usage with a new Gliffy product? Team communication is scattered across email, IM chats, meetings, wikis, and task management software. Itâ€™s difficult to keep track of current status, whatâ€™s done, what needs to be done, etc. Itâ€™s time-consuming to understand how written tickets relate to visual designs, user flows, software and information architectures, and complex systems. Details get lost in translation, leading to incomplete and inaccurate product experiences, wasted work, increased cost, and frustrated teams. There is no single, up-to-date destination for teams to see what needs to get done and why, the current state of their projects, and short-term versus long-term vision. Development teams are often guessing whatâ€™s needed due to unclear or hidden product requirements, slowing progress and limiting their ability to succeed. Look from different angles to build understanding of usersâ€™ pain points. Map the problem space to uncover hidden opportunities. Simply talking to customers isnâ€™t enoughâ€”team-based note-taking and interview processing lead to better pattern identification, and deeper, more meaningful insights. With a clearly defined audience and high-value problem to solve, the team started to think about potential solutions that fit the problem space. As we began concepting, though, it became clear that we were still lacking some focusâ€”the team would be able to move more quickly and efficiently by setting tighter constraints around what weâ€™re willing to take on, and what weâ€™re not. The stigma is that enterprise products are stuffy, dated, bloated, inefficient, and uglyâ€”products with little regard for user needs, polish, or delight. From the start weâ€™ve acknowledged and embraced that user expectations and the bar for quality, efficiency, and craftsmanship is as high in enterprise as it is in consumer products, and only getting higher. Weâ€™ve held ourselves accountable to this, across broad experience direction and the nuance of every pixel and interaction. Jira is a deeply complex product that enables teams of any size or structure to run agile development any way they like. Our goal is to enhance the experience of using Jira, not replace it. Itâ€™s a product thatâ€™s widely used, and not only would it take forever to rebuild all the functionality that it provides, it would be a massive waste of our time and effort. Our goal is to enable the 20% of tasks that 80% of Jira users do day-to-day to be as efficient, visual, and compelling as possible. One of our key business objectives was to increase overall breadth and frequency of Gliffy product use, so building an inherently multiplayer / multi-user product was a driving pillar behind every design decision we made. This is a product for cross-functional product development teamsâ€”itâ€™s not for teams of oneâ€”and its user base will grow through use of the productâ€™s core functionality. 3rd-party product integrations, notifications, and team-based mechanics like live collaboration and organic invites exist specifically to create value for teams working together, as well as organic product growth. With a solid foundation in place, we began to think broadly about how a new product might relieve some of the pain that product development teams feel around cross-functional communication, scattered documentation, and complex, text-based task management tools. This involved a ton of whiteboarding, sketching, working to deeply understand other products both inside and outside of our space, and building prototypes to test and understand where weâ€™re on track and where weâ€™re not. Some pieces came easy, while others took endless rounds of exploration, prototyping, user testing and validation to get right. All the ideas; a few strong, many weak. Learn from other products and solutions in and outside of the market. Compare ideas at higher fidelity. It was important for us to understand the benefits and deficiencies of potential directions with low initial cost to the team. As a rule, these validations were done quickly and with as little upfront effort as we could manage. The goal was speed and ROI: do as little work as possible to give clear form to an idea, and then get an honest read on its strengths, weaknesses, and potential to benefit our users. Once a hypothesis was formed and its strongest potential direction agreed upon by the team, it was given rough shape in a prototype and shared with current users, beta testers, and / or research subjects depending on which phase of the project we were in. Many prototypes and conversations inform where our ideas fall short andâ€”most importantlyâ€”where potential lies. This cycle of build > test > iterate > repeat allowed us to evaluate a ton of different directions relatively quickly, and weigh the pros, cons and trade-offs with both the internal team and external testers. Every conversation helped inform what made sense for users and what didnâ€™t, and where the productâ€™s real value lay for teams. Low-fidelity prototypes help prove initial product value and inform high-level design decisions like general information architecture early on. As a small team creating a complex product from scratch, efficiency was critical to maintain momentum and set us up for success. It was important that we clearly articulate the granular interactions, UI elements, and components that enable our product experience in a way that doesnâ€™t create a lot of communication overhead or effort for our team. Shared symbol libraries, well-defined style guides, and interactive / animated prototypes provided the means for us to systematize the design, and communicate the nuance of the product experience for validation, team buy-in, and successful implementation, while minimizing the need to go back and re-work elements when direction changed. Well-defined components make design fast, efficient and consistent across the team, and reduce missed details in code. Minimize guesswork for engineers by clearly communicating how disparate UI elements combine to form complex components / screens, various states, responsiveness, etc through component-based design, style guides, and interactive / animated prototypes as needed. Share and version control all design elements and components with the design and engineering teams, so weâ€™re always working on top of the same foundation. By maintaining a tight design system and component library, the team is forced to make conscious decisions on when and why to add new components versus re-using existing onesâ€”no more one-offs that look identical to another component or element (+/- 1 pixel). Enable the team to focus on higher value problems like the experience rather than the padding (or font-size, or colorâ€¦) by building screen designs with state-based components. Update the parent component and cascade its changes across all instances in all drawings across every team member. Well-articulated design elements enabled our dev team to mirror the Sketch components one-to-one, as designed, leading to implementation efficiencies across the entire team. This process has led our team on a long and challenging journeyâ€”from initial â€œblank whiteboardâ€� questions of what a new product at Gliffy might be, do, and look like, into initial user research, problem discovery, concepting, directional validation, multiple closed betas, all the way to launch and now growth while running live. By leveraging visual documentsâ€”be it a flowchart, wireframe or screen design, or even a napkin sketch or whiteboard drawingâ€”rather than text, what was once a multi-paragraph Jira issue describing complex visual information like product interactions, user flow, or component state is now reduced to a couple lines of text. These issues are also then consumed more efficiently and effectively when they show instead of trying to tell a story that is inherently visual. By spatializing and grouping tasks directly on top of visual documents, teams can quickly see work relationships, any gaps in the plan, and progress toward successful completion. More detail is captured and consumed with less effort across the team. From design through engineering and ultimately QA, the product development team maintains a clear understanding of what needs to be built and how every individual task fits into the big picture of product and user experience, so better work is done more accurately the first timeâ€”with fewer do-overs. Our team uses Gliffy Project to build Gliffy Project. Itâ€™s helped us clearly communicate big picture vision alongside granular tasks, leading to more efficient development cycles, less wasted time and effort re-doing work by getting things right the first time, and happier cross-functional teams. Gliffy Project â€œcanvasâ€� experienceâ€”where Jira issues and visual documentation come together for clear team communication. Wireframe example with Jira issue details.